This trip has expanded our awareness and love for wild animals. We’ve walked among pythons and tarantulas, swam with turtles and sharks, sat with penguins and seals. But, one of our true animal loves has to be the humpback whale. These complex and beautiful creatures move with such grace and power and they are so complex that even the experts don’t fully understand their intelligence. Even though we technically had about three months to make our way down the East Coast of Australia with our open-ended Greyhound bus passes, once we heard about the humpback whales at Hervey Bay, our plans immediately changed. Humpback whales migrate up and down both the East and West Coasts of Australia. We had seen some great humpback action on the West Coast in Freemantle. 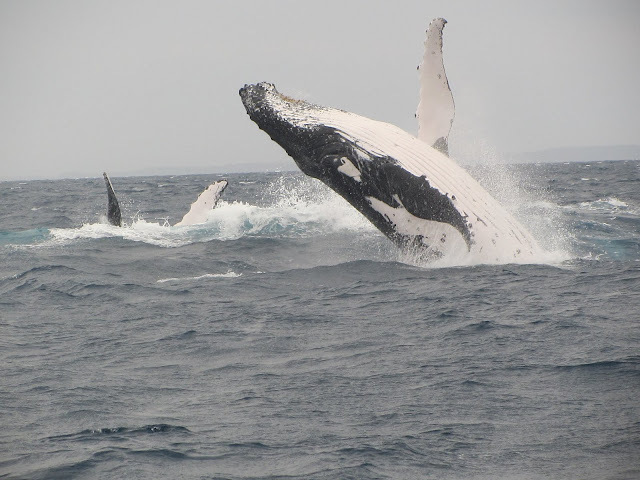 But, after further research, we found out that some of the most amazing humpback whale activity on this planet happens in Hervey Bay, Australia between July and November. We were travelling South along the East Coast towards Hervey Bay in the beginning of October. If we wanted to see the magnificent humpbacks there, we had to hurry.